USD is being supported by the China-US trade war outcome predictions and now EURUSD is chiefly under the influence of NFP data update. 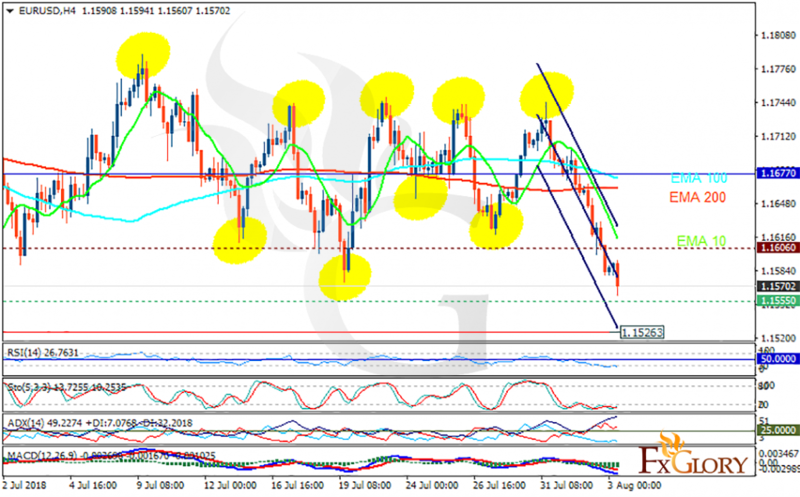 The support rests at 1.15550 with resistance at 1.16060 which both lines are below the weekly pivot point at 1.16770. The EMA of 10 is moving with bearish bias in the descendant channel and it is below the EMA of 100 and the EMA of 200. The RSI is moving in oversold area, the Stochastic is moving in low ranges and the MACD line is below the signal line in the negative territory. The ADX is showing strong sell signal. The price may fall towards the previous low at 1.152 however, 1.165 breakout will push the pair up towards 1.17.